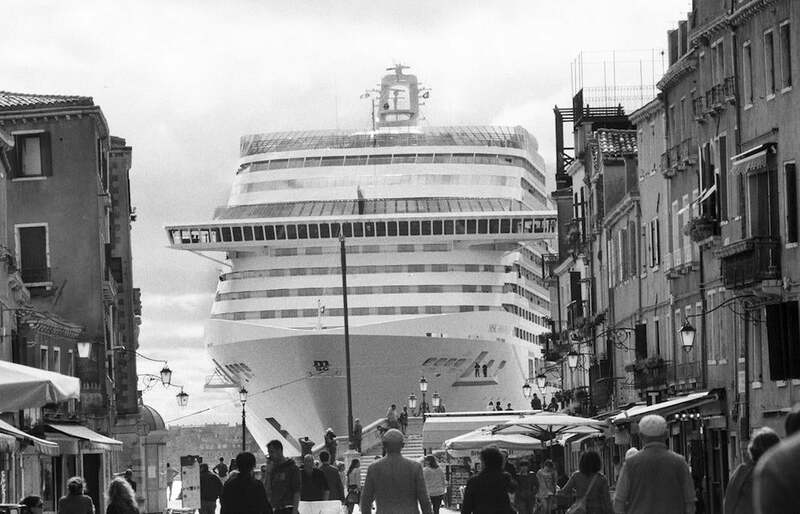 Gianni Berengo Gardin photographs Venice’s massive cruise ships. 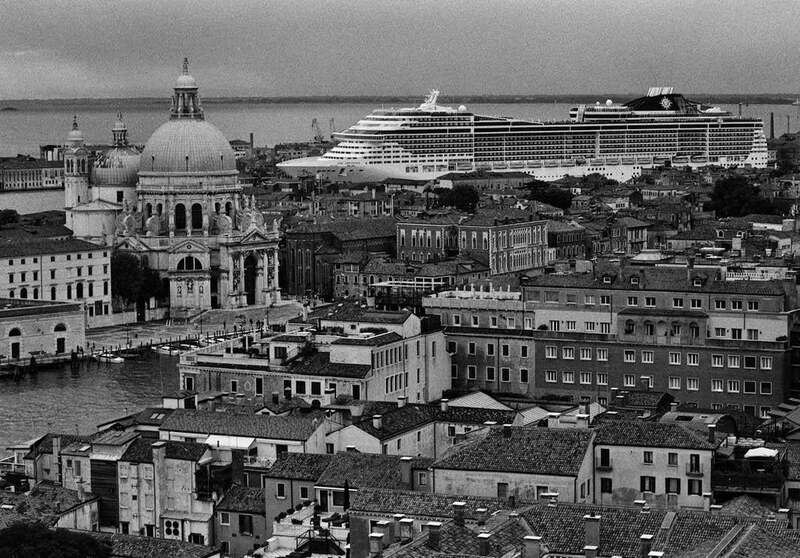 Are These Giant Cruise Ships Destroying Venice? A 2013 photograph of the MSC Divina cruise ship passing by the old town. Tourism is the economic lifeblood that keeps Venice running. But is it destroying what’s charming about the city in the process? In Gianni Berengo Gardin’s photos of massive boats lumbering through the lagoon and the city’s fragile canals on their way to the international cruise ship terminal, there’s no mistaking his perspective. Passing by historic squares, churches and buildings, the ships look like colossal eyesores, obscuring everything in their path. “About two or three years ago I was in Venice for an exhibition of my work that took place at ‘I tre Oci’ and I saw from a window one of those big ships passing by; initially I was extremely shocked by the visual pollution, but then I came to know about all of the other kinds of pollution that those ships cause, about the bottom of the lagoon, about the atmosphere, and about all of the consequences of the transit of those big ships,” Berengo Gardin said via email. St. Mark’s Basin, Punta delle Dogana. Venice. August 2013. A cruise ship passes along the Guidecca channel. When he made the photos, Berengo Gardin knew about the debate surrounding the influence of tourism and, specifically, the movements of cruise ships. 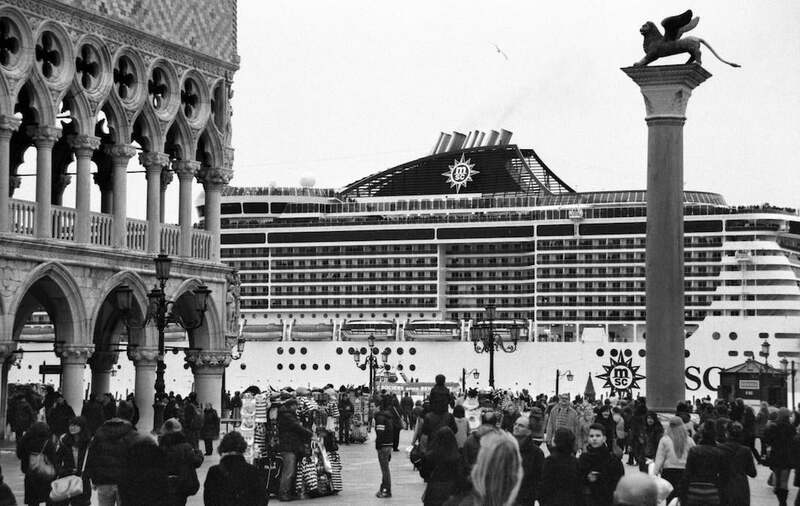 But he never expected the photos to attract the sort of attention they garnered this August when Venice Mayor Luigi Brugnaro, a businessman who supports the cruise ships, blocked an exhibit of the photos from being shown at Doge’s Palace. The move attracted international press coverage and invigorated the No Grand Navi movement, which opposes the ships’ current route. “It is logical that some people will defend the big ships, because around 4,000 people work in this business, but most of the Venetians stand against it. The No Grandi Navi committee does not support the possible loss of all of those people’s jobs. The problem for which they fight is the transit of the big ships in the San Marco Basin and in the Giudecca Canal—that they obviously want to impede. If the big ships passed through another path to arrive into the port, it would be fine, and the jobs of 4,000 people would not be in danger,” Berengo Gardin said. 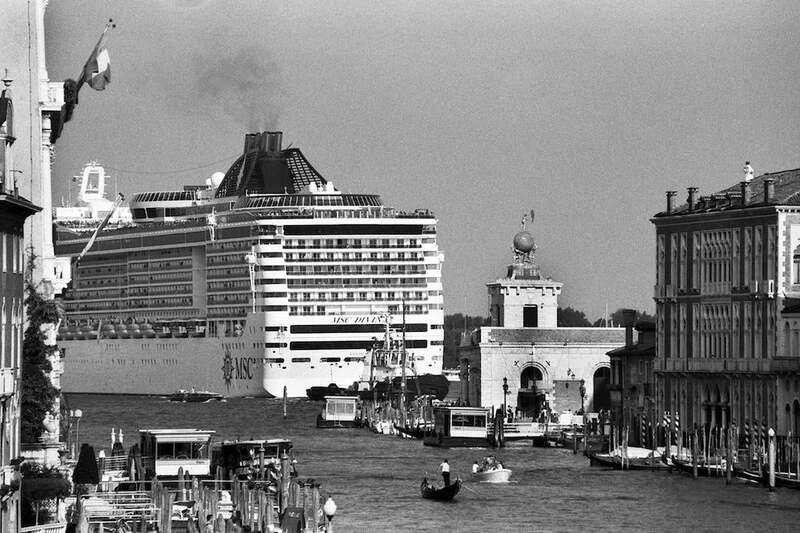 The ships are perhaps just the most visible sign of the explosion in tourism that Berengo Gardin says is suffocating a city that has seen its population drop by tens of thousands as the number of visitors it welcomes annually has jumped into the tens of millions. “The local handcraft is disappearing. There are featureless shops filled with products bought from Chinese stores. In Piazza San Marco, near historical and traditional bars like Florian and Quadri, there are now soulless ice cream places and bars, at the service of mass tourism only,” he said. 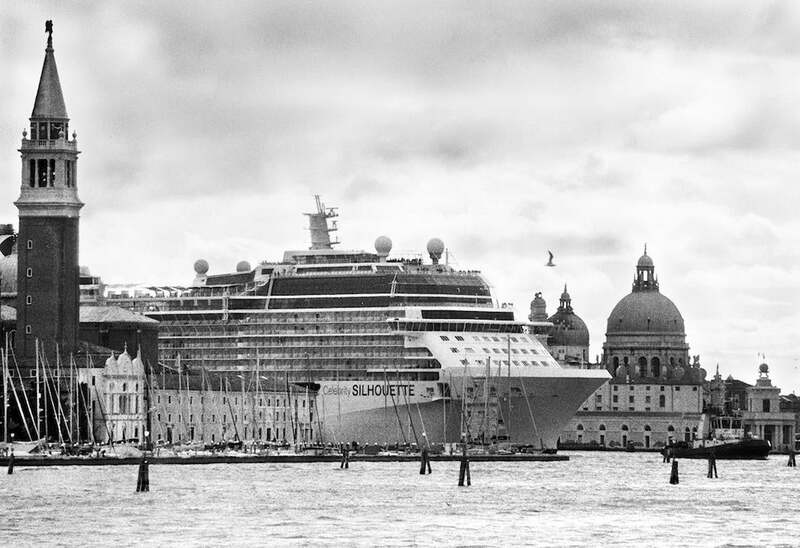 The Celebrity Silhouette glides by the old town from the Giudecca channel between the St. Mark’s Basin and Punta della Dogana. Venice. April 2013. In previous photography books he’s dedicated to Venice, Berengo Gardin has aimed to showcase its beauty. But now, he wants people to confront the ugliness he feels has engulfed Venice and come up with a solution to preserve the city he loves. “My grandparents’ house faced out to the Piazzetta dei Leoncini; my father was essentially born in Piazza San Marco, and I, even though I was born by chance in Santa Margherita Ligure, lived in Venice for 30 years. My wife is Venetian and my children were all born in Venice. For these reasons, I feel particularly close to the problem of the big ships: because I feel extremely Venetian. For this and many other reasons it is important, and not just to me, that Venice’s character is not wiped out,” he said. 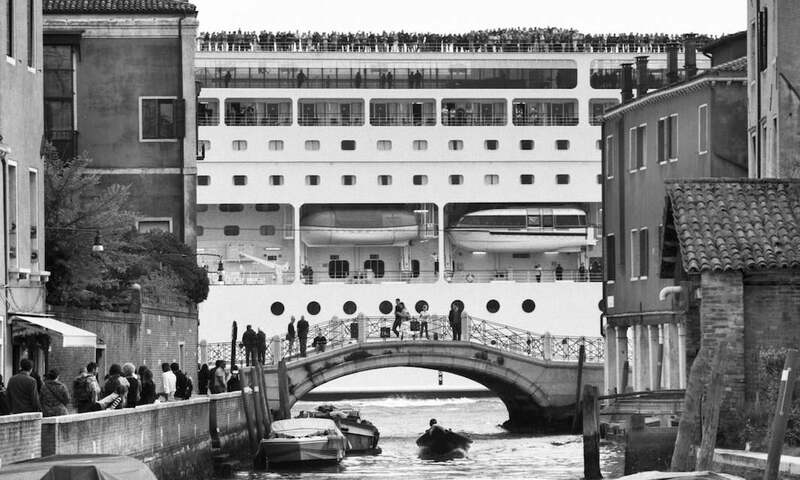 Berengo Gardin’s photos are on display in an exhibit, “Venezia e le Grandi Navi (‘Venice and the Big Ships’),” from Fondo Ambiente Italiano in coordination with Fondazione Forma per la Fotografia and Contrasto at Negozio Olivetti in Venice’s Piazza San Marco through Jan. 6. A book of the same name is available from Contrasto. A cruise ship in front of St. Mark’s Square. 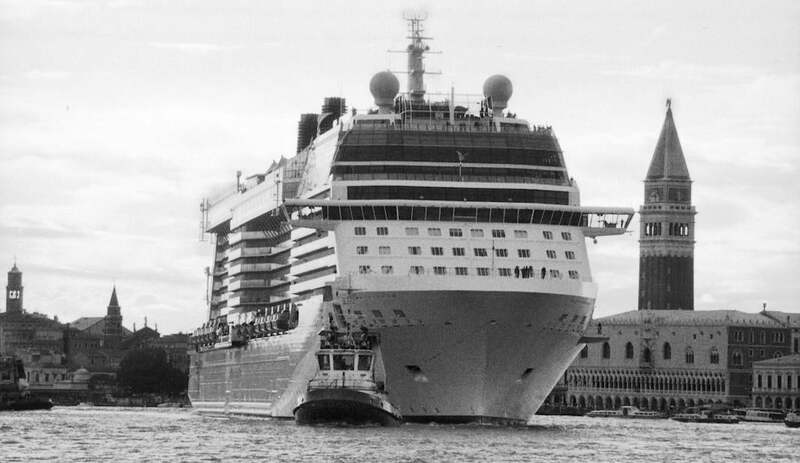 A cruise ship is pulled by a tug boat through Venice’s lagoon.